Peggy Wimberly got a big surprise when she showed up in Barcelona for her Mediterranean cruise aboard MSC Cruises’ Meraviglia. Although she had made full payment for the trip to her travel agent, the agent never paid for the cruise. As a result of the nonpayment, MSC canceled Wimberly’s reservation weeks before the sailing. But no one informed her. And although MSC eventually allowed Wimberly to board the ship, it cost her an unexpected additional $1,633 — and the loss of her preferred cabin. Now Wimberly wants the Elliott Advocacy team to track down the refunds owed to her. This is yet another tale that points to the importance of persistence and precise record-keeping. Both the cruise line and the travel agent made errors here, but only the consumer suffered the financial consequences. And it took a determined consumer advocate four months to unravel the entire mess. Wimberly’s saga began when she and three of her friends decided to take a Mediterranean cruise. Using a travel agency called Chelsey Travels, the group booked two cabins aboard the Meraviglia. An $800 deposit held each cabin. Wimberly chose to pay her cabin’s deposit by check. The other ladies paid via their credit cards. Wimberly’s payment method would prove to be a contributing factor to the troubles that were on the way. Soon the group members each received a confirmation of their Mediterranean cruise from Chelsey of Chelsey Travels. For the next five months, all was well with the group happily planning their journey. In May, it was time for each of the friends to pay an $862 balance for the cruise. This time Wimberly paid with her credit card. But when she reviewed her statement at the end of the month, she saw two identical charges from MSC. Wimberly assumed that Chelsey had made a mistake. She thought the agent must have billed her credit card for her cabinmate’s cruise as well. However, her cabinmate confirmed that MSC also charged her credit card $862. After being unable to reach Chelsey about the extra charge, Wimberly decided to file a credit card chargeback. She never reached out directly to the cruise line. That proved to be a mistake. The Fair Credit Billing Act allows consumers to file disputes over billing errors. However, consumers must attempt to resolve any dispute directly with the merchant before filing a chargeback. There are a variety of reasons that this is important. In this case, Wimberly would have discovered some critical information about the status of her cruise if she had contacted MSC before she left for Europe. When MSC didn’t fight the chargeback, Wimberly won the dispute. The bank permanently reversed the extra $862 charge. And Wimberly and her friends began to pack for their much-anticipated cruise. Without ever receiving any boarding documents or further instructions from Chelsey, Wimberly boarded a flight to Spain. She carried only a copy of her original confirmation from the travel agent. The lack of boarding information should have been a signal that something was wrong with her cruise reservation. But in Wimberly’s vacation excitement, that warning sign passed without notice. When Wimberly tried to board the ship, however, a different sign from MSC made itself completely clear: A stop sign. Wimberly and her cabinmate were prevented from boarding the Meraviglia. That’s when the two learned that MSC had canceled their reservation weeks earlier for nonpayment. Stunned, Wimberly explained that she had paid her travel agent in full for her portion of the cruise. The MSC representatives gave the duo two options — pay the balance owed of $1,633 and come aboard OR watch the Meraviglia sail away without them. Wimberly chose the first option. She paid a second time for her cruise. And although the friends had originally booked a cabin with a balcony, their new cabin assignment had only a window. Wimberly hoped to be able to resolve this fiasco when she returned home. It turns out that was a lofty hope. When Wimberly arrived home, she was frustrated. A cruise that was supposed to cost her just $1,262 had ended up costing over twice that much. And no one would acknowledge her dilemma. She tried to reach Chelsey but still received no response. MSC was of no help either. The cruise line stood by its contention that the travel agent never paid for the cruise on Wimberly’s behalf. MSC acknowledged that the agent had processed one payment of $862 via the credit card Wimberly had provided to Chelsey. However, when Wimberly disputed that charge, the cruise line canceled the cruise for nonpayment. MSC also told Wimberly that it had notified Chelsey of the nonpayment and cancellation several weeks before the cruise. But Chelsey had never given Wimberly even a hint that she no longer had a cabin aboard the Meraviglia. She allowed the hapless travelers to find out the shocking news thousands of miles from home. Can Elliott Advocacy uncomplicate this cruise fiasco? My fellow advocate Dwayne Coward took charge of this case. He immediately saw the oddities in Wimberly’s paper trail. The travel agent had never provided a final confirmation. The only information that Chelsey ever sent was the short email highlighting the cost and dates of the trip. Dwayne explained to Wimberly that she should have received much more information before departure. Wimberly confirmed that Chelsey had never sent her anything further after the initial friendly announcement. And then Dwayne reviewed the rest of Wimberly’s evidence. He could see there were problems on MSC’s side as well. Wimberly was right: MSC Cruises had charged her twice for the final payment of $862. She had only disputed one of those charges. And Wimberly also had a canceled check for $800 that was paid directly to Chelsey. Lastly, she provided the credit card statement that showed MSC had charged her card $1,585 on the day of the cruise. There was also a $48 foreign transaction fee for that charge. What had gone wrong here? Can this travel agent explain herself? Dwayne first attempted to contact Chelsey. When you use a travel agent, that person should always be your first advocate if troubles arise on your trip. Unfortunately, this agent had provided no help at all to Wimberly. And Dwayne was beginning to suspect she had actually contributed to the problems. Not surprisingly, Chelsey ignored Dwayne’s inquiry, as she had done with Wimberly’s and MSC’s. It was time to move on to MSC. Dwayne next set his sights on MSC Cruises for some clarification about the double charge and subsequent cancellation. He soon heard back from the executive resolution team at MSC. In a lengthy and thorough review of its investigation, our executive contact explained that the travel agent never paid for the cruise in its entirety. Wimberly had paid her cabin’s deposit with an $800 check. But the travel agent had not covered that deposit. We have looked into the matter and completed our investigation into the concerns raised by Ms. Wimberly. While Ms. Wimberly completed the deposit payment of $800 through a personal check to the travel agent, we uncovered that the agent’s credit card used to complete the transaction with us was left unsettled by the bank. This means MSC Cruises never received the funds. Unfortunately, due to an error in communication between the credit card processor and the booking system, the $800 payment remained in the booking system, allowing Ms. Wimberly to make the additional payment [the final payment]. The MSC Cruises’ auditing team identified this unsettled charge during periodic auditing a few weeks before the cruise and contacted the travel agent concerning the balance due. Further, the executive team went on to say that MSC had only charged Wimberly one time for the final balance. MSC suggested that she speak to her bank, which should be able to confirm that only one charge came from MSC. Our MSC contact clarified that the travel agent had also never responded to any of its requests for payment. Nor had she responded after MSC alerted her of the cancellation. Lastly, MSC pointed out what Dwayne had already noted: Wimberly and her cabinmate had traveled to Europe without any cruise embarkation documents. The executive ended her email by recommending that Wimberly contact her travel agent since she had never sent the cruise deposit in the first place. That detail is what set Wimberly’s problem in motion. Dwayne went back to Wimberly with the bad news. MSC would not refund any of the additional cruise payments she made on the day of embarkation. Wimberly was taken aback since she believed she had sufficient proof to show the multiple charges from MSC. She told Dwayne that she would gather more information from Bank of America and come back soon. About a month later, Wimberly provided additional credit card proof that showed the double charges from MSC. She was able to show that she only disputed one charge. Dwayne agreed that the bank had given Wimberly strong supporting documentation of the two identical charges from MSC. Dwayne went back to MSC and provided the bank statements from Bank of America showing two separate charges of $862. A follow up on this, Ms. Wimberly had her bank provide her with the statement for May along with the following two months showing the two separate charges from MSC cruises each in the amount $862. The following two months’ statements show no other credit in that amount was received beside the one she disputed. Based on this, can you please have your accounting department recheck? Her account does show two charges from MSC and only one credited back (due to her dispute). It appears she was double-charged, and since she should not have been charged due to the travel agent’s actions and the error in communications between the credit card processor and the booking system, she is requesting a refund of the $862. The good news from MSC did not come swiftly even then. It was over two months later after Dwayne had sent follow-up requests, that it finally arrived. The MSC accounting department did another review of Wimberly’s charges. That team found the $862 overcharge on this go-around. First, we would like to thank Ms. Wimberly for her patience while we fully investigated the issue and her request. We would also like to offer a sincere apology to Ms. Wimberly as we realized upon further investigation that Ms. Wimberly is in fact owed the $862 that she has requested, and the time it took us to uncover that this is the case is not typical and also not acceptable. 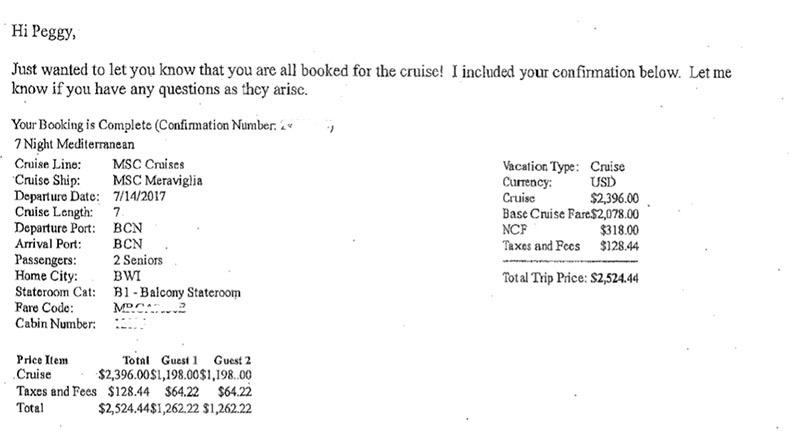 Additionally, MSC covered the foreign transaction fee that Wimberly paid on the day of the cruise. Although Wimberly is feeling vindicated with this MSC victory, she continues to face another battle. Chelsey owes her $800, and Wimberly wants it back. Dwayne has checked, and this agent is not a member of any professional organization. She also appears to operate independently of any agency — if she is practicing at all at this time. We know from this tale that Wimberly is persistent. She says she won’t give up the pursuit of the return of her $800. Her next move? She intends to sue Chelsey in small claims court. And the lesson for travelers? Before you choose a travel agent or advisor, it’s important to do your research. Our publisher, Christopher Elliott gives some helpful guidance here in his article on the topic. Check if the person/agency is a member of any professional organization. A membership in ASTA (American Society of Travel Advisors) is typically a good sign of a reputable travel provider. Check their presence on the BBB website and review sites such as Yelp and Google. Ask for recommendations from your friends and family. You may also want to ask the travel provider for references that show a positive track record. Never pay for your travel with cash, check, wire transfer or other money transfer services (like Venmo). We know from experience that these payment methods are the chosen ones of illegitimate “travel agents.” When you use any payment method other than a credit card, you immediately put yourself at a disadvantage should problems arise. Always keep in mind, credit cards provide you with protection that paying with cash does not.